I covered the Icebird project some time ago. 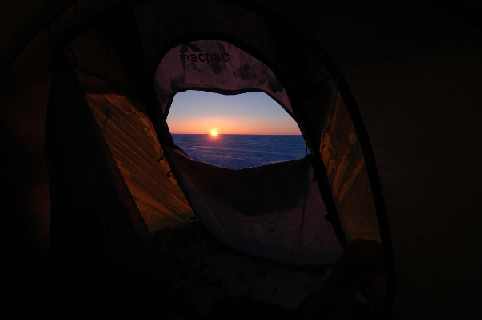 Since their return from Greenland Pat Spiers and Ben Deacon have been making further progress and intend to have another crack at Greenland in April/June next year before their big Antarctica expedition in December 2007. Remember, this will be an attempt to transverse the frozen continent with their revolutionary vehicle, the kitesled. They have some new pictures and a fascinating video of New Zealander Peter Lynn developing the kitesled too. Sorry, no sub titles are provided for non New Zealander speakers. Meanwhile the other Icebird, Andrew McAuley has a little project to keep him occupied until the Antarctica trip. This month he will attempt to be the first person to paddle a kayak from Australia to New Zealand. Thats a journey of 1600 km and he is going to do it solo and unsupported in only a modestly mo dified sea kayak. But, he has some competition, two young Sydneysiders will attempt their own Tasman crossing on December. I'm astonished by these ventures, usually the traffic is in the other direction. Lloyd Godson is still developing the Biosub project. You can read the latest news here but I was interested to learn he intends to use the Fluorosolar light pipe system to provide sunlight to th e habitat. I have long though optical fiber systems are an ideal way to provide Space habitat illumination. 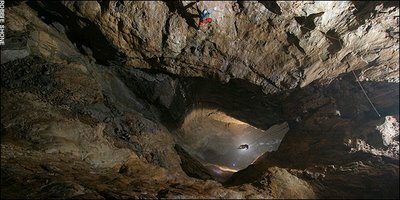 Finally, as a follow up to Dennis's article yesterday, the Brits have recently discovered their largest cave, with a height of 140 meters from floor to ceiling. (Now we know where the British hid during the Quantum Storm) . Have a look at the article it reads like a Jules Verne story.